An alternator consists of two parts, the stator, and the rotor. The stator is the stationary part of the machine, and the rotor is the rotating part of the machine. The stator carries the armature winding in which the voltage is generated, and the output is taken from it. The rotor of the machine produces the main flux. The parts of the stator are the frame, stator core, stator windings, and cooling arrangement. The frame of the stator is made up of cast iron for a small-size machine, and welded steel for large size machines. To reduce the hysteresis and eddy current losses, the stator core is assembled with high-grade silicon content steel laminations. A 3-phase winding is put in the slots cut on the inner periphery of the stator. The winding is star connected and is distributed over several slots. When current flows in a distributed winding it produces an essentially sinusoidal space distribution of e.m.f. The term salient means 'projecting'. A salient-pole consists of poles that are projected out from the surface of the rotor core. These are used for the rotors for four or more poles. The rotor is subjected to changing magnetic fields that is why it is made of steel laminations to reduce the eddy current losses. Identical dimensions poles are assembled by stacking laminations to the required length and then riveted together. After the field coil is placed around each pole body, these poles are fitted by a dove-tail joint to a steel spider keyed to the shaft. 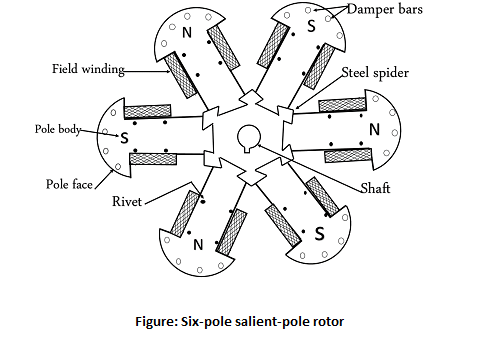 Salient-pole rotors have faces to damp out the rotor oscillations during a sudden change in load conditions. A non-uniform air gap accompanies a salient-pole synchronous machine. The air gap is minimum under the pole centers, and it is maximum in between the poles. The pole faces are so shaped that the radical air gap length increases from the pole center to the pole tips so that the flux distribution in the air gap is sinusoidal. This will help the machine to generate sinusoidal e.m.f. To give the alternate north and south polarities, the individual field-pole windings are connected in series. The end of the field windings is connected to a d.c winding by the brushes on the slip-rings. The salient-pole generators have a large number of poles and lower operating speed. Salient-pole alternators that are driven by water turbines are called hydro-alternators or hydro generators. Cylindrical-rotor machines are also known as non-salient pole rotor machine. The construction of the rotor is such that it forms a smooth cylinder. It has no physical poles as in the salient-pole construction. These rotors are made up from solid forgings of high-grade nickel-chrome-molybdenum steel. In about two-thirds of the rotor periphery, slots are cut at regular intervals and parallel to the shaft. The d.c field windings are connected in these slots. The winding is of distributed type. The unslotted portion of the rotor forms two pole faces. These machines have a small diameter and long axial length. Such construction limits the centrifugal forces. Thus, the cylindrical rotors are useful in high-speed machines. Steam or gas turbines drive Cylindrical-rotor machines. Cylindrical-rotor synchronous generators are called turbo-alternators or turbo-generators.